There is a lot of style going on here. Interesting. I would ask him: What’s on your agenda for the day? A man from no past. All is well tied in him: belt and suspenders. Couldn’t write it better than that. This man is a cool cat. I hope the sense that he is unconcerned with the lah-de-dah in life in life is correct. Should add: looks handsome, too! 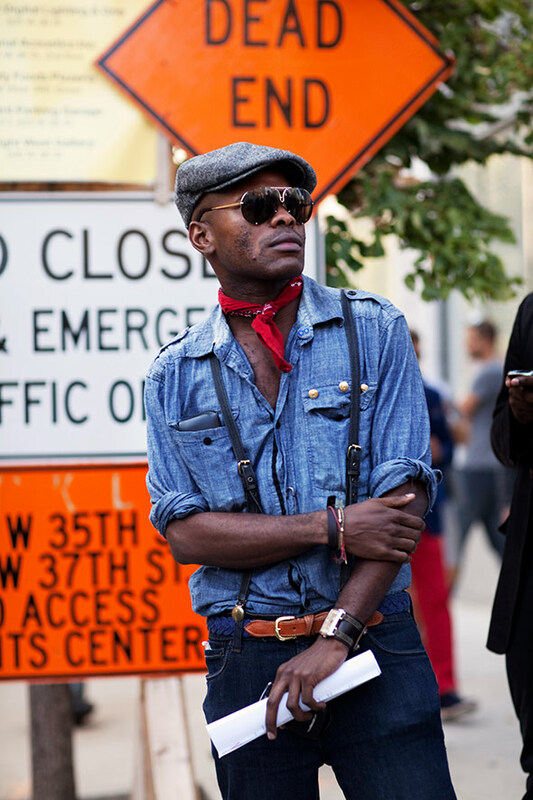 Love combination of the denim shirt with the leather suspenders. However, too many accessories: the bandana, the cap, the sunglasses, the thick watch and the armbands. With a little bit more relief of skin this look will be perfect! Great Outfit! but i like all the accessories he got! they all fit perfect on his look! and love love the belt! I like the golden buttons on his pocket and that little red scarf is a nice touch to his outfit. cool guy. Cool; the only difference between this and the 60′s was that instead of hair, he has a belt. Lose the belt! Suspenders with a belt cross the line from useful aestheticism to aesthetic silliness. Love the rest of it. Love the denim shirt and his style. I like this outfit very much. I wear it myself quite often with other details and accessories but I understand his look exactly. It’s sturdy and refined at the same time. Beautiful sunglasses and watch. I am rarely keen on denim total looks but the belt rocks! What a style, way to pull jeans shirt on jeans pants! I don’t know if this is about the attitude (fierce!) or the outfit (denim chic) but this gentleman looks stunning. It may be all about the man behind the camera then? Great picture. Good to see that the Sartorialist is back in the streets with real people. The watch…Omg, what’s that watch? I love this look, but why? why? a belt AND suspenders? Perfect bro! One the best stylist I know till date! Support frm UK my bro! Suspenders and a belt? That kind of ruins the look for me. Love the photo and love how he is dressed! That mix of orange and blue complementary colors makes this even more striking. he looks kind of awesome at first. the shirt is beautiful and he’s super good looking. but so many accessories! belt + suspenders + bandana + bracelets + watch + sunglasses + hat. too much. I love everything about this guy’s look!He looks comfortable in this stylish combination he is wearing. I like his sunglasses too and the gold buttons on a denim shirt! I really do like the shirt and the watch.. very interesting cool type of guy..
Great look! But can you trust a man who wears both suspenders and a belt? He can’t even trust his own pants. I love this guy’s look. He looks confident! I love the splash of red and the golden buttons on his denim shirt. Denim. It looks great on his skin. Suspenders and belt, I agree with Anora…I do not like eather. Chambray and denim is back! Staple look for Fall, if you ask me. And are those denim suspenders? I wonder, after reading the comments, whether the trick to looking this good is all in the details of the accessories. After all, an ordinary denim shirt, blue jeans, but then, add, add, add. The sunglasses look to be vintage Porsche Design. If they are, they’re classics. waaay too much going on. That guy looks sooooo cool! I can’t find any words for his entire outfit! 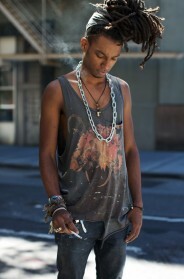 I like his accessories too, nothing like a guy who knows how to add a little umph to his outfit!. I love his outfit against these signs! The red bandana is the perfect touch… the color looks amazing on him. A modern urban cowboy movie: Dead End. I know …. rules are meant to be broken. But wearing suspenders AND a belt is like wearing a bowler AND a baseballcap. For me this leads nowhere. A dead end end indeed. Could have kept it minimal!! He’s so cool! I’d lose the glasses and that red thing though. Agree-the belt is overkill and unnecessary. What’s the saying, “Before you leave the house, look in the mirror and remove one thing.” Should have done so here. Otherwise, a great look. Keino Benjamin is the only one that can pulled off suspenders with a belt. Depends on what type of belt and suspenders. He got the right Kiel James Patrick Croffix belt and Diesel denim suspenders and connected them great. Get with it guys. Creativity speak for itself !!!!! Keino, I like this outfit. Solid look and great shot !!! Over-accessorize. Reminds me of the recent GQ article on street fashion running amok. Dlight from La Rue A Du Style, Paris. lots of style packed into a few well chosen elements. love everything about this including the suspenders and belt together. classic cool, somehow a late sixties jazz vibe. …and against the blue against the ‘danger orange?’ love it. Each item which he has chosen to augment his denim ensemble speaks volumes. Anyone know how to tie a bandanna like that? He is exuding style and confidence. Oh man. He looks like he came from a different time. oh gosh. enough with the championing of fashion dogma! so he’s wearing a belt and suspenders – and pulling it off better than somebody in an ironed everything with a matching everything and a shiny everything. you think he doesn’t know that rule? didn’t look it square in the face before blowing it to smithereens? @henri. No, he is not Seal, he is Keino Benjamin – a NYC stylist. No one can do denim on denim quite like him. Cool guy. Thought belt AND suspenders were a no-no. Other than that, great outfit! Great picture! Spent a long time just taking it in. the suspender and the watch does all the magic here . Cool look, but never trust a man who wear a belt & braces at the same time. The belt is great, loose the braces. clip on braces? really? and with a belt? Leave the silly braces at home, and this becomes a good look. Great look, however why belt and braces, does one not negate the other?? Isn’t it wrobg to wear suspender and belt same time? So funky. I bet this guy has some very interesting ideas. I have seen this guy a plenty on here. Always a treat.